Honoring our troops who have and are serving to bravely keeping our country free! GOD BLESS AMERICA! This Americana Belsnickle's robe is a rich deep navy trimmed in a crimson chenille. Double trim of off white and crimson surround his wonderful, fully detailed face. 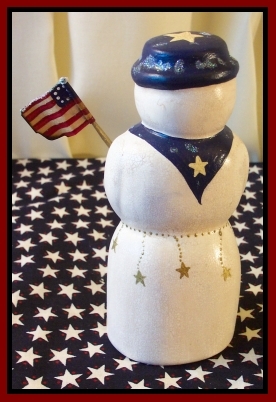 The base is an aged mustard with stars to accent the Americana theme. 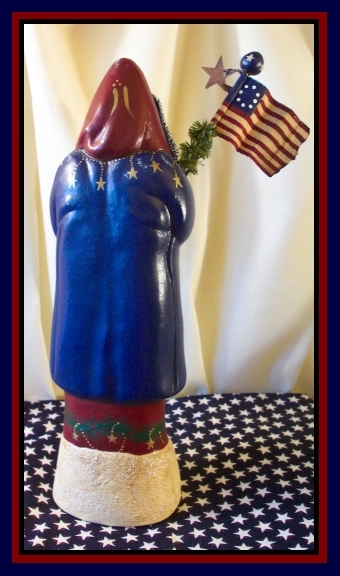 In the bend of his arm, proudly he waves his American flag... hand made, tattered round the edges, looking very old. The 'staff' of the flag is trimmed with a pine branch topped with an old red berry. The flag is removable for storage. Very, very fine mica is added here and there to give this big guy a frosty, wintry look. 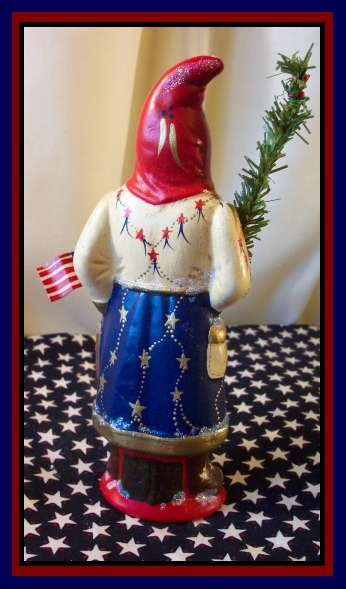 Add this collectible Americana Belsnickle to your collection today. He arrives at his new home packaged in his own gift/storage bag with name tag. The bag makes a unique gift-giving package or is a perfect place to store him during his 'off' season...if you can stand to put him away! Looking at the face of this Belsnickle, he seems to be looking directly at you....asking the 'big' question! His robe is navy and hood is an old burgundy trimmed in old navy chenille. 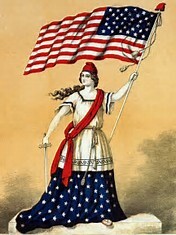 He is wearing a red, white and blue fringed sash adorned with stripes and stars. Old gold stars and chains ripple here and there on the front and back of his robe. 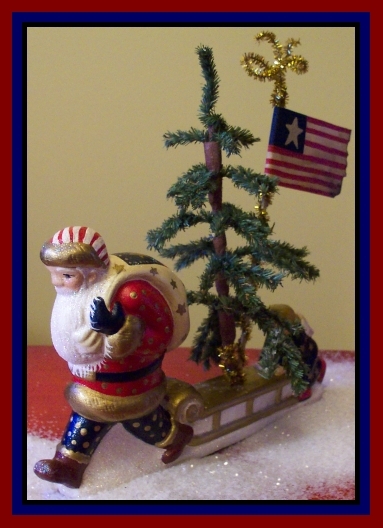 His flag is handmade, topped with rusty stars and proudly waves from his arm. He is aged to look old from the beginning. Standing a full 12 inches tall, he will make a perfect addition to your collection or a wonderful gift to a Belsnickle collector....surely a piece to become a family heirloom. St. Nicholas, the patron Saint of Christmas, is where the idea of our modern day Santa derived. 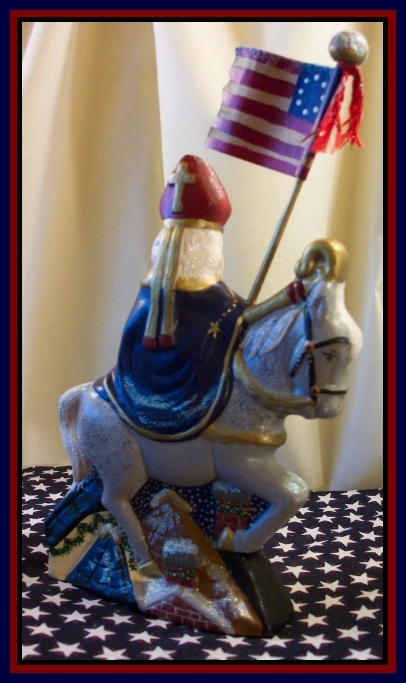 He is celebrating America by riding his gray dapple horse across snow covered rooftops sporting a large handmade American flag. 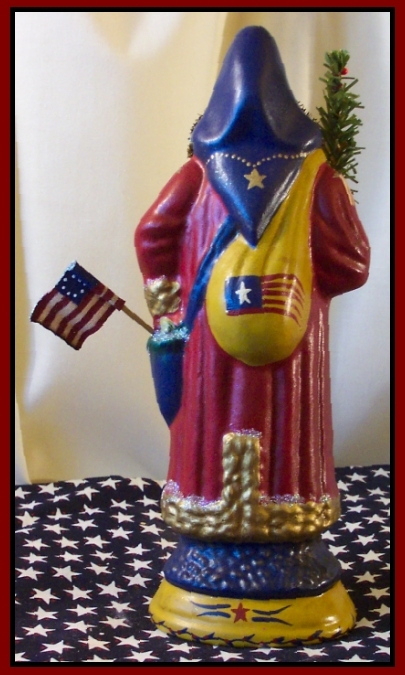 His robe is navy trimmed in old gold stars and trims. The white gown he's wearing has a Burgundy bottom trim and the old gold stars and chains he's holding are hanging down over his gown. Hours and hours of fine detail complete this fine collectible. Aged to look old from the beginning, he is sure to become one of your favorites. 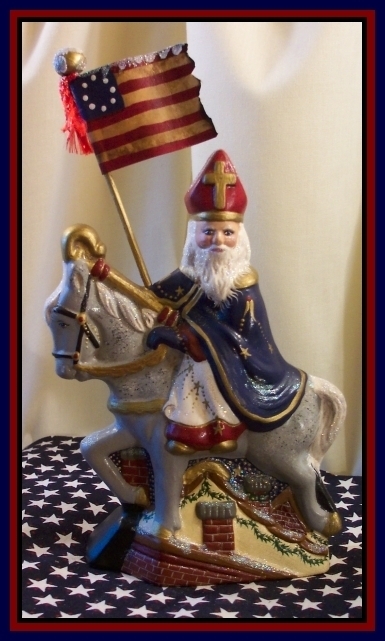 Whether adding St. Nicholas to your own collection or giving him as a gift, he will become a family heirloom. Yes, St. Nicholas was real. He was born during the third century, in a small town call Patara, then Greek and now can be found on the southern coast of Turkey. St. Nicholas was born to wealthy parents who died when St. Nicholas was young. Being raised a devout Christian, to obey Jesus' word, he sold what he owned and gave the money to the poor. Nicholas spent his entire inheritance and life helping the poor and suffering. He was made the Bishop of Myra as a young man and is remembered throughout the land for his generosity for the needy, his love for children, and his constant concern for the safety of ships and sailors. 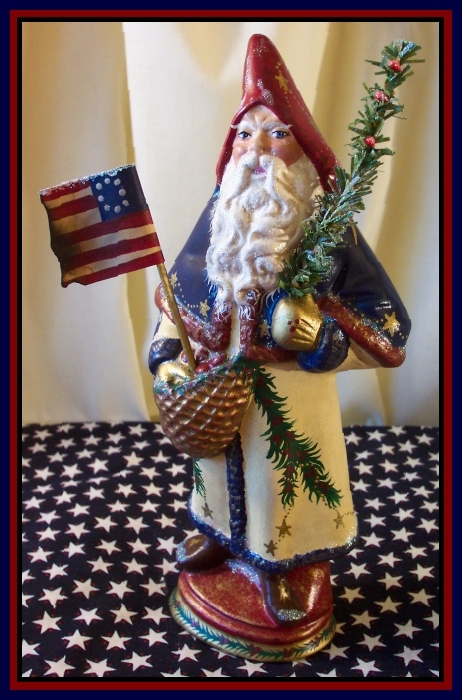 Loving America and proud to show it, this Americana Apples Santa just shines with beauty and detail. He has the most perfect face, eyes and beard, he makes you smile when you look at him. His gold trimmed robe is deep red adorned with old gold 'stars' hanging by dotted 'chains'. He is wearing an old navy hood trimmed with gold tinsel. On one shoulder he carries an old apple sack filled to the brim with all sorts of apples, green, red, and yellow....saving a little room to stash Olde Glory. Over the other shoulder he carries his mustard toy bag stuffed with wonders to behold. On the back of the bag is painted another Olde Glory. Wearing brown boots, he stands on a navy and mustard stand. Please enlarge the pictures to see all the detailing that went into making this an all-time favorite! He's as American as Apple Pie! Sure to become a family heirloom as well as the prefect gift for that Santa lover on your list. 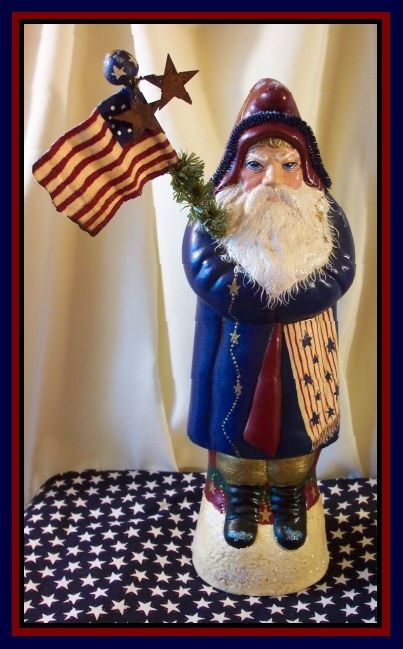 Americana Father Christmas stand tall, 9 inches, proudly showing his colors. His entire robe, hood and bag are laden with stars, some old gold, some red and others white. For this occasion Father Christmas is wearing hood his finest antique white robe with a rich navy cape, and burgundy hood. He's also wearing his best brown boots standing on a gold sponged burgandy base. 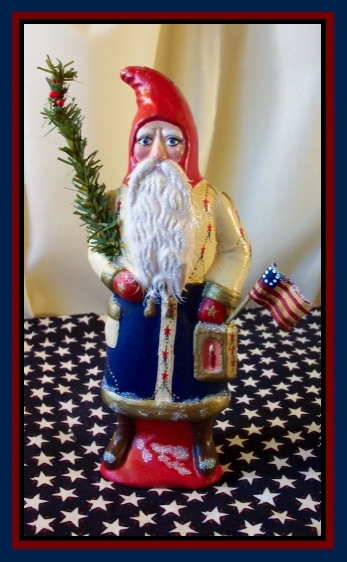 Besides sporting his handmade American flag, he carries a pine stem in his opposite arm...dotted with holly berries. A painted berry dotted pine bough drapes from his old gold apple/toy bag. The look on his face, so happy and pleasant. You can see the twinkle in is oh-so pleasant eyes...he makes you smile back at him! His beard is thick, long and some of the best detailing I've seen in any mold. Take a good look at the pictures, not missing all the detail that goes into making this a very special piece to add to your collection. Aged to look old from the beginning, he is sure to become a real memory maker in his new home. 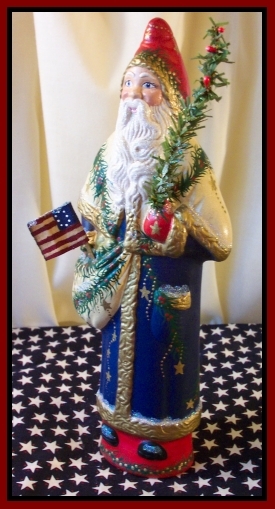 This Star Spangled Night Watch Santa proudly wears his red, white and blue. He carries his handmade, aged flag and his latern as he makes his way through the dark streets performing his yearly duties.....checking on the little children making sure they are safely tucked in for the night. His years of duty shows on his tired, old face. Santa's robe is painted antique white and old navy. His hood is Christmas red. Stars attached by dotted chains adorn his robe and hood and latern. Small detailing of hand stitching show on his pocket and down the front of his robe. 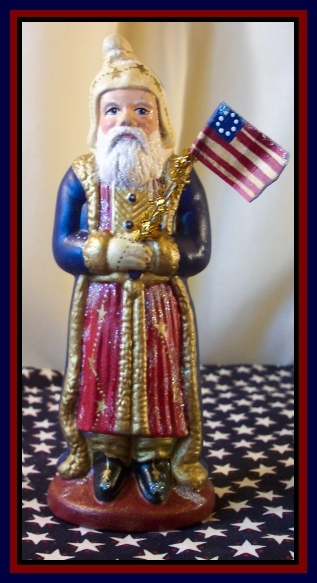 He is made from a very old chocolate mold, finely handpainted and aged to look old from the beginning. He looks like an antique when he arrives at his new home....sure to become a family favoite for years to come. 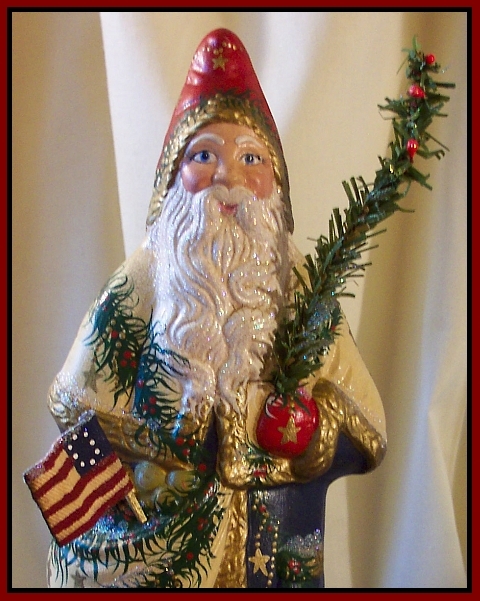 This Americana Pere Noel stands proud, displaying his colors. He is all dressed up in his best patriotic outfit. The star-studded old navy robe hangs just perfectly over his burgundy gown, both trimmed in an antique gold. His antique white hat is unique in shape and design. Trimmed in red, white and blue as well as gold stars and chains. He has on his best black boots trimmed with gold tassels. Pere Noel is fashioned of chalkware from a Letang antique chocolate mold. Letang molds are known for good design and lots of detailing. Enlarge the picture to capture all the facial detailing on this guy, so pleasant and calm. 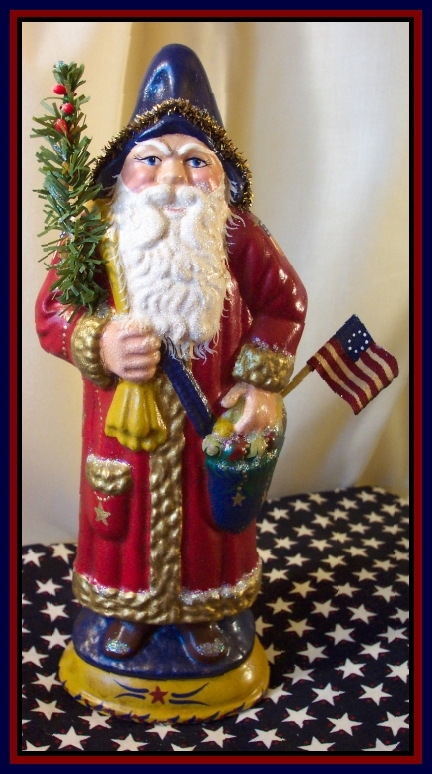 This Santa would make a perfect addition to your collection as well as a wonderful gift to the Santa lover on your list. Anytime of the year is the best time to present a Santa to a collector! 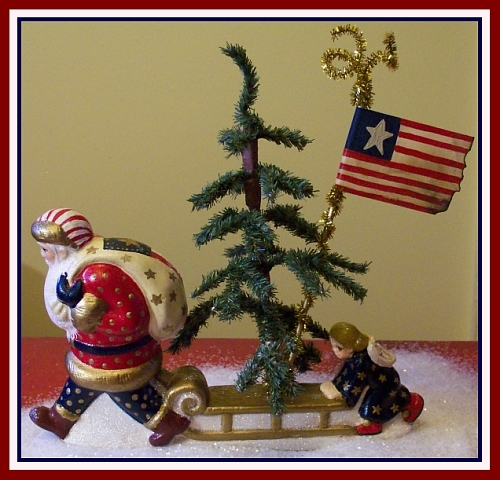 Trudging through the snow, the sweetest little Angel is helping Santa push a sled loaded with a Christmas tree and Old Glory. Santa asked the Angel for help because he had a special delivery to some lucky family. They both picked their best outfits to deliver a Patriotic Christmas! 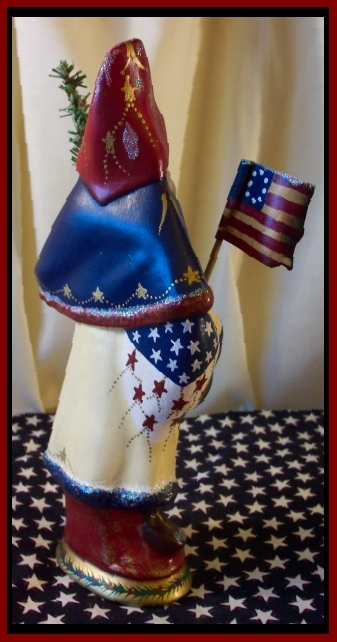 The faux feather tree and flag are both handmade and are removable for easy storage. Proud of his American heritage Patriotic stands tall and proud showing his colors! All done up in red, white and blue, he carries a pine stem in his hand while sporting his handmade American flag in his over-the-shoulder bag. Painted berry laden pine boughs drape down his front and back. Old gold chains and stars are entwined throughout the boughs. Such a perfectly happy face, his twinkling eyes and long detailed beard brings this big guy to life. Sure to be a favorite collectible for genereations to come. 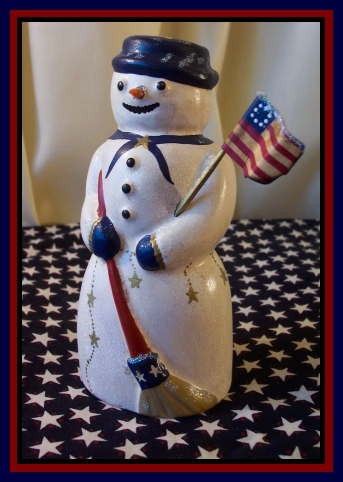 Olde Glory Snowman sweeps his way through the winter streets with his Americana broom, happily carrying his time worn, handmade flag in the crook of his arm. The navy hat, his favorite, is topped with one star, matching his best navy scarf adorned with a stars. He remembered to wear his old gold chain belt with stars hanging down his cute little plump body. He is so happy you can almost hear him giggle.....must be because of his handmade carrot nose! What a perfect addition to your snowman collection and don't forget that snowman collector on your gift list! Copyright © 2017, The 1840 Stone House Collection. All rights reserved.